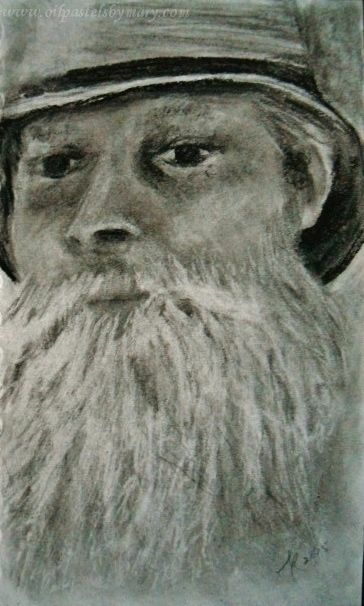 This drawing was only done for the purpose of practicing a full, scruffy beard using charcoal. Practice Drawing, Beard (7×5) Strathmore Sketch paper – using brick, compressed and vine charcoal. Both a click eraser and kneaded eraser were used for pulling out fine beard hairs and a camel hair brush was used for blending. I brush the entire surface with charcoal first so a high value of color was used then throughout as a base for the beard and face. Five layers of charcoal were drawn and blended to develop the fluffiness of the beard. I think the fluffiness was accomplished because of the many layers of different values, but would have liked to see more squiggly lines for some of the beard hairs laying on top. It was a good practice. The next time I draw a beard I’ll do it with a more meticulous way of managing the lines and strokes. Thanks for looking ~ click on the image for a larger view. Reference photograph from Vee Rolliard of pmp was used. This entry was posted in Drawings and tagged beard, charcoal, drawing, man. Bookmark the permalink. Thank you Aquileana – Happy weekend to you as well! Yes Charcoal is an amazing medium and you are an expert at it! The texture in his beard is wonderful Mary and brings life to the portrait! Gosh, how tricky it is to do a beard. Thanks so much Gallivanta! Have a lovely weekend. Now that is a very proud owner of a beard Mary! It seems he’s really comfortable to display it or pose for the purpose. Lovely texture accomplished here, layering is the very key technique to arrive and achieve a desired result and you done it well! Hi Eva, this gentleman is a backwoods farmer (in real life) and he does carry that beard well. Maybe a bit bushy, but was fun building the layers and seeing how far to take it – shadowing underneath with mid-tones I found was key to getting the desired 3-d feel to it. Thanks so much it was a great exercise – this charcoal is addictive. And we all enjoy your addiction to charcoal! Have a great weekend Mary! It’s fun, isn’t it to work beards! Great job, Mary. Thanks Elena, intimated me at first – then thought what the heck, just get on with it. Thanks for your encouragement. The more I see charcoal work and read your descriptions, the more complex it seems. … 5 layers? WOW! Thank you Frank, it is a mediums that I’m really beginning enjoy it’s diversity. Wow Cyndi what a great surprise to see you! I’m not on facebook, so I haven’t gone on to see what you have been up too – wish you were still working your blog. Thank you so much, you have can see I’ve expanded a bit, but still continue painting in oil pastels (although the past month it’s been drawing). Big TX hug back to you!! Wow, that really is good! Oh, what a jolly soul he appears to be! Why am I thinking sailor man? I actually love the beard as it is…(and that says something because I am not a beard-loving girl!) What I really notice is the top whiskers of the beard and how they do seem to pull from the face. I really think you did well with that! Hi A! Thanks very much – poor guy is a farmer, but since I cropped him you can’t tell what he is wearing or his surroundings. Thanks for your thoughts and noticing the top layer of whiskers, that’s exactly what I was after. Have a great evening. one of my favourites of yours for your capture mood and character here. Hi Cynthia, hope you aren’t too snowed in – here it’s coming down pretty good up in your neck of the woods. Thanks very much for your thoughts on this one. It’s not exactly technically on spot with the face features, but the point of the exercise was working toward a respectable beard. Thank you – can you believe it’s February already? Hi Marina – hope you had a good day at the studio. Enjoy listening to your music. Thanks on my beard, just a little project of practicing for a future piece. I liked the technique. Have a great week. I think you captured “beardness” very well this way. There’s a lot of feeling and communication of texture in your rendering. Hi Catherine, thank you so much for your artistic eye on this one. The beard doesn’t quite fit his face, but I’m more interested right now in the texture and fullness of the beard. Thanks for your thoughts I think I’ll be using this technique on a future drawing. Have a great week. Thanks Karen – never fails to amaze me how much nuance there is to drawing w/even the simplest of subjects/objects. That’s why it’s a work in progress for many of my pieces. But I do enjoy the whole process, drawing is a very calming interest for me. Thank you, do appreciate your encouragement.